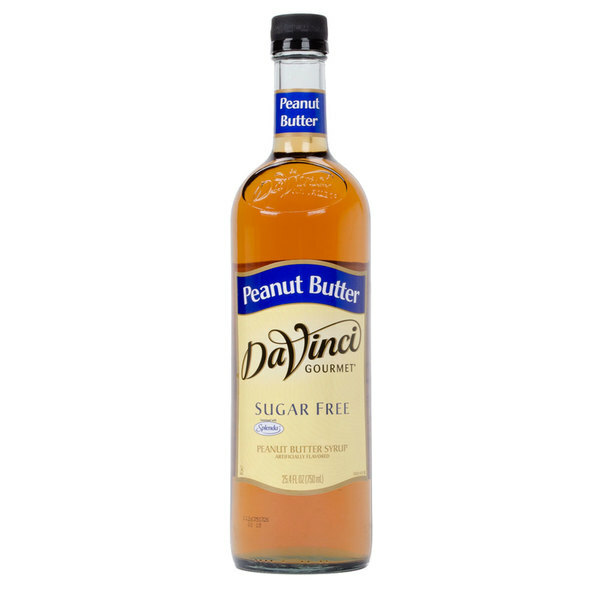 This user-friendly bottle of DaVinci Gourmet sugar free peanut butter flavoring syrup allows your busy baristas to quickly and easily serve up delicious hot, cold, or blended drinks with irresistible flavor without the sugar content! DaVinci Gourmet flavoring syrups complement your beverages without overpowering them or being too sweet. They are specially formulated to resist curdling in milk and hold up well under heat, making them the perfect choice for espresso-based drinks, brewed coffee or tea, and more. Indulge in the rich and nutty flavor of this peanut butter classic coffee flavoring syrup! Create one-of-a-kind peanut butter frappes or blend this syrup with other flavors like chocolate for irresistible dessert drinks. You can also bake it into cookies and cakes for a sweet treat! Sweetened with sugar free, no-calorie Splenda Brand Sweetener, this sugar free blend is sure to be a treat for your health-conscious patrons! Splenda tastes like sugar, giving you great flavor without the calories. 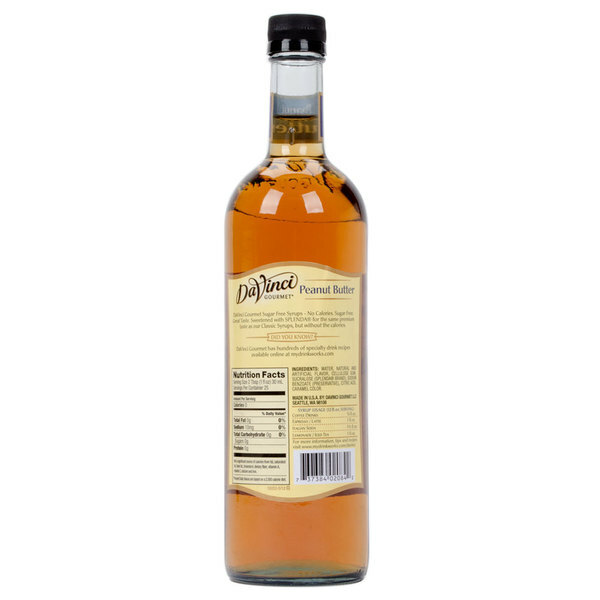 Sold in gourmet coffee shops, specialty food stores, food service outlets, and grocery stores, DaVinci Gourmet products, like this sugar free peanut butter flavoring syrup, have a long history of commitment to quality and superior taste. Impressively it tastes just like peanut butter! I prefer the sugar free version but DaVinci does make a regular one if that is more your preference. The sugar free peanut butter is great and the syrup is the perfect consistency for making lattes. The taste is really great and love the fact its sugar free. Peanut butter can be an 'iffy' flavor when it's artificial, but who needs the extra calories from the real thing? I wasn't disappointed in the least in this great tasting product! I even have been using it in my coffee and on my cottage cheese. There is no chalky aftertaste, just a smooth peanut butter flavor. Give it a try if you are a peanut butter lover, you won't be disappointed! I have been using this sugar free peanut butter coffee flavoring syrup every single day that I make coffee for the past month. It turns out perfect every time that I use it. I will definitely be buying some more of this stuff soon. The DaVinci sugar free peanut butter coffee syrup is wonderful. The syrup has an authentic peanut butter taste without sugar. A great way to make my peanut butter fudge. A really good sugar free option to have in your coffee shop. Your customers who are watching their sugar intake will really be impressed with this unique option. Pairs really well with sugar free chocolate syrup for a great "reese's" cocoa. The Sugar Free Peanut Butter syrup is so good. You can't tell it's sugar free and it lasts a very long time. Tastes great in coffee. Peanut butter is a classic flavor. This one was enjoyed in everything. It was liked best when paired with chocolate, such as in hot cocoa. I dislike splenda. I love this syrup. It's very light and yumma. I mixed it with everything. And it's no sugar added so it's perfect for me try it and you won't be sorry. As a post gastric bypass patient. I use these syrups to make my protein drinks have some more life and not just plain blah flavor. These really taste like the real thing and don't have an artificial taste to them. This syrup is great in everything. I use it mostly for my morning smoothies, I can have a peanut butter banana shake without putting in peanut butter to fatten it up.